In Parshat Beshalach (read on Shabbat Shira – the Shabbat of Song), Miriam, the sister of Moses, leads the women of Israel in song after crossing the Sea of Reeds. As it says in the Torah, “Miriam, the prophetess, Aaron’s sister, took a timbrel in her hand, and all the women came out after her with timbrels and with dances.” This is a great opportunity to sing and dance with our kids and recreate the splitting of the sea. 1. Make five holes around each of the pans. 2. Place dried beans between two pans. 3. 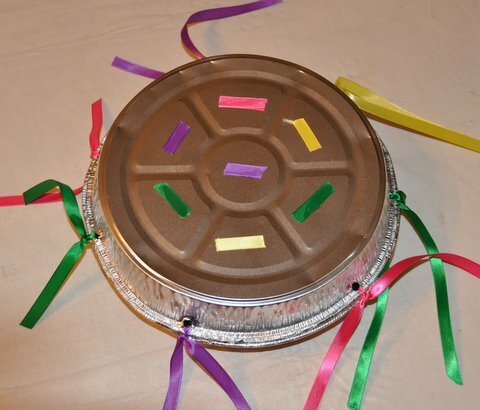 Use ribbon to attach the pans to each other. 4. Decorate the tambourine with additional ribbons. This craft can be found on ChallahCrumbs.com, a wonderful resources for Jewish projects and crafts.